At Wolfers Lighting, we offer unique lighting labs, allowing our customers to truly experience lighting design in action. Step into one of our interactive demonstration labs and you will fully understand the impact of various light sources, including LED, and scenarios when incorporated into different room styles and surfaces. Our showroom displays are all grouped by lighting style, making it easy to see firsthand what will work for lighting your home or space, as well as what matches your design style. Wolfers’ lighting consultants will work with you in one of our labs to help visualize how your renovation plans and selected lighting products will fit your space and meet your needs. Our lighting labs are specially designed to accommodate various rooms and situations. 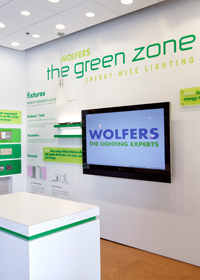 From our kitchen and bath lighting labs to our exclusive Green Zone green lighting lab, Wolfers’ interactive demonstration labs are what set us apart from the average lighting company. Wolfers also offers specific labs that feature tech lighting, artwork lighting, and outdoor lighting. In today’s technology era, lighting continues to evolve and is ever-changing. Visit our tech lighting lab today to learn about new light sources such as LED lights, compact fluorescent lights (CFLs) and lighting control systems. Experiment with lighting techniques, from grazing to wall washes, and see firsthand how various light intensity and color can impact different surfaces. We encourage you to bring in a sample of your project materials so you can see what lighting works best with the granite you selected for your kitchen counter or the marble you chose for your bathroom sink. For passionate artists and collectors, Wolfers has perfected the skill of artwork lighting. Visit our artwork lighting lab to learn how certain lighting techniques and light sources can greatly vary depending on the medium the artist used to create the piece. Artwork lighting requires careful consideration of light intensity, angle, color, and spread. Our experts will work with you one-on-one in the lighting lab to help you make the right choices that will accentuate the details and inspiration of the piece. If you are seeking an exterior lighting plan for your home, Wolfers’ outdoor lighting lab is the perfect place to experiment. Discover how moonlighting, up lighting and grazing can add theatrical effects to your landscape. Our outdoor lighting lab allows you to see what will work best for brightening up entrances, highlighting architecture, and adding a warm and welcoming atmosphere. Whether you are looking to design a kitchen or to light up your driveway, Wolfers is here to help. To test out your lighting plan in a real live setting, make an appointment at one of our unique lighting labs in either our Waltham or Allston showroom today.